All Office Bearers take an Obligation at the Installation to carry out the duties of their office "faithfully, zealously and conscientiously", and to "support the Master in his various duties". This support takes two forms - Masonic and Social. Attend lodge meetings as regularly as you can, particularly if you are a Steward or are holding a senior progressive office (i.e. Chaplain, IG, ID, SD, WJW, WSW). Send an apology if you cannot attend, particularly relevant to three consecutive meetings. Help to put the furniture away after the meetings, or to serve tea/pies when we have a visiting deputation. Support official deputations to other lodges. There are usually seven during the year. If you can attend even one or two, it helps the Lodge and encourages the RWM. Attend Management Committee meetings. These are held on the first Wednesday of each alternate month. (Note that the RWM, IPM, DM, SM, WSW, WJW, Secretary and Treasurer are ex officio members of all Lodge Committees). e prepared to take a turn serving behind the bar on meeting nights. If everybody does this, you will probably only need to do it twice a year. Donate a prize for the Installation raffle. It doesn't have to be anything grand, everything helps. Support any social functions that the Lodge may decide to hold by attending yourself and encouraging friends to come along as well. They are good fun! Undertake to sell a books of tickets for the Christmas Draw. Donate a prize for the Christmas Draw. It doesn't have to be anything grand, everything helps. Be prepared to be trained to take a turn behind the bar, on a rota basis, on a Friday or Saturday evening. The more we get, the fewer number of times you will have to do it. Sometimes this will be on the evening of a hall let. These are a valuable source of income to the lodge, and on these evenings Brethren sitting in the lounge will usually help out if it gets busy, or stand in for a while to give you a break. Help out at Work Parties, which are held every Wednesday evening during June, July and August. This may involve tidying the grounds, doing odd jobs inside the lodge, etc. You don't have to be there every week: even once a month helps. 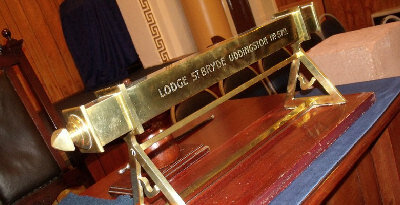 A number of the Lodge Offices have specific duties assigned to them, either as a normal part of the duties of that office, or by custom within Lodge St. Bryde No. 579. These are outlined below. Senior Warden: put away the furniture after Lodge meetings and ensure the Charter is locked away in the safe in the Stock Room. Lodges; organise Lodge harmonies (the Installation harmony is still introduced by the WJW, who gives a vote of thanks at the end). Depute Master: attend to the three lesser lights at the opening and closing of the Lodge, and when the Lodge is passed, raised or reduced. Substitute Master: either he or the Depute Master to attend to the top table refreshments after Lodge meetings (except for the Installation); record details of hospitality to visitors in the bar diary as the cost of this is borne by the Lodge; keep a separate record of top table refreshments ordered by Lodge members, and collect the money to pay for these. Director of Ceremonies: ensure meetings start promptly; present Deputations into the Lodge; ensure everything that is needed for the Ceremonial is to hand (e.g. Candidate's apron, tracing board, working tools, Mark tokens, etc. ); at Annual Divine Service ensure Brethren are properly lined up prior to procession into the Church. Senior Deacon: organise bar rota for meeting nights (omit senior Office Bearers and Past Masters on deputation nights, as they will be looking after our visitors). Man the rods. Junior Deacon: make sure you know the SD office thoroughly - you will have to do it at least once a year, and you never know when the SD might call off at short notice! Man the rods. Inner Guard: on the evenings of official visitations into the Lodge, make sure you know the name and number of the Lodge and the name and designation of the Brother heading the deputation (e.g. RWM, IPM, SPGM). Collect the retiring collection at the end of meeting. Chaplain: opening and closing prayers, plus prayers and Scripture readings during the Ceremonials; say grace before the meal at the Installation ; and do one of the Scripture readings at the Annual Divine Service. Bible Bearer: Carry the Bible in and out of Lodge; adjust the square and compasses as appropriate; arrange for someone to switch main lights of and on as appropriate during degrees (be sure and check how the visiting Lodge wants it done on deputation nights). Jeweller: collect the jewels from Office Bearers after the last meeting in November and ensure they are cleaned-up for the Installation. Stewards: Attend to catering needs at harmonies and clear up afterwards.